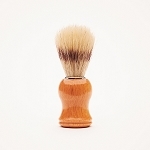 Our eco friendly shaving alternative includes a beautiful handmade stoneware shave cup, a Fuzzy Fleegal Shave Bar, and a natural shave brush sporting a wooden handle and natural boar bristle. Our natural shave soap is formulated to create a foamy lather with an added clay to provide slip so your blade wont slide. We add a blend of pure essential oils to our shave soap the make your skin feel soothed and refreshed after shaving. All you need is your favorite razor and you are set! 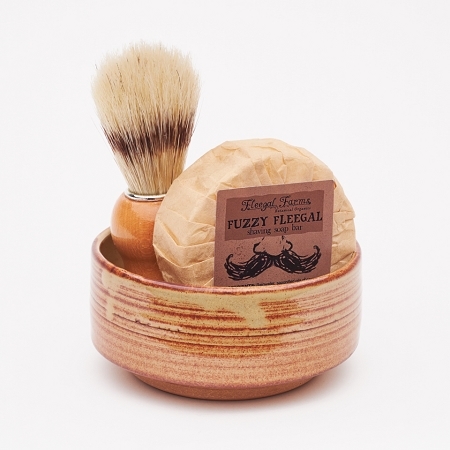 This item provides a healthy alternative to the chemical filled shaving creams on the market, and with only a paper label to toss in the recycling it's easier than ever to go green. * Each cup ships by itself. A detailed "directions for use card" is included with each set. Each cup is one of a kind and may vary slightly from the one photographed.